The United Kingdom needs to reduce its carbon emissions by 80% by 2050, creating energy from renewable sources is not enough to meet these high targets. 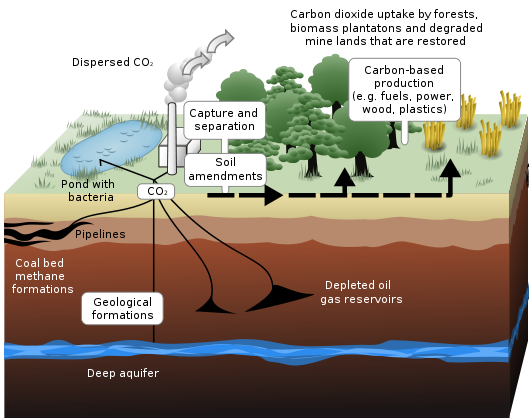 However the idea of CCS can provide an effective route that can dramatically reduce CO2 produced in the air from the various pollution sources. It is argued that without adopting the CCS initiative the UK would need to build between 5-7 Nuclear power stations or 13,000 wind turbines in order to match the current demand for energy. Energy security has never been more important, where some supplies are being affected by political whims of one country towards another (Eastern Europe to name one). Thus it is in the UK’s interest to create as much energy as possible where the government can ensure its stability and ensuring long term security. The ethical question is an interesting but an important one to note, the question being why should we take action when countries like China are building more coal stations per year than we can reduce? The important point is that China is still a developing nation and will become the largest user (using 27%) of the world’s coal. China although polluting heavily, is one of the biggest spenders on green technologies, there is a lot to be seen yet in where China is seen to improve its Carbon footprint over the next decade. The fact that the UK is leading the way in such initiatives can provide more job security as more research can pave way to new opportunities by where the UK could be the first and thus able to export new ideas. The UK already exports various types of marine energy, and where it may improved via revenue created from exporting such technologies . The main aim of CCS will be to capture at least 90% of emitted fumes and store underground 700-5000m under the North Sea, filling the empty areas left where oil had been taken. The storage of carbon will continue to be held offshore to address any fears of safety to the populace. Storage facilities have a life of 100 years where after this time it is hoped better technologies will be in place. The carbon will be stripped from other chemicals via a chemical solution wash and captured for transportation to the offshore storage areas. Storing Carbon can prove to be expensive and dangerous, but it needs to be done to meet EU Law. There are many arguments against CCS which suggest that the process is an easy way out in meeting targets. The argued lack of efficiency can be noted, the process of Carbon storage consumes a third of the energy the plant produces in the first place. The cost is another important issue and the costs of the process does not necessarily outweigh the benefits, but it is a cost that has to be applied in order to address the Carbon problem the UK faces but is also an opportunity for the UK to lead the way and export new initiatives.